In this series, we are bluntly criticizing the politicians, the City planners, the Police and the Congestion Commission, as you may have figured out. I also need to pay my respects to the people who stick their neck out. Just after Part 1 of the Series was published, the mayor of the City's DoT, Ayfer Baykal, announced that her party SF (People's Socialist Party) aims to make yet another important shopping street much more pedestrian and bicycle friendly. The first shopping street that was transformed and made pedestrian-only was Strøget, back in 1962. The street just celebrated its 50th anniversary this past weekend. Back then, everyone predicted sudden death for all the shops. It never happened and today it's the most expensive retail real estate space in Denmark, and has been for decades. 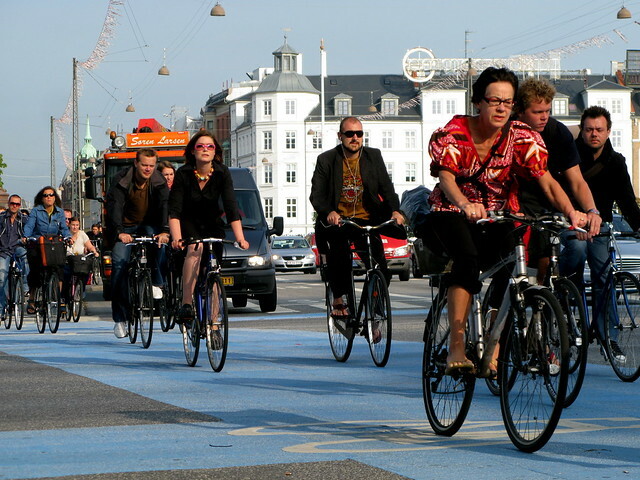 The second big tranformation is the famous bus/bike street, Nørrebrogade, which was also criticized for killing retail. Few of the critics choose to remember that the street refit coincided with the financial crisis, which affected shops all over the nation. Or the fact that the people who actually live in the neighbourhood WANTED the new street and are happy about it. Also, many people, unfortunately, have become so accustomed to the externalities of big cities, that they become “qualities” associated with living in the “big” city (Copenhagen really isn't big). It is true that the initial test phase and the latter full reconstruction took a long time to complete and, coupled with the financial crisis, was hard on local trade but now it is finished. The increased number of pedestrians, public transport commuters and cyclists (bicycle traffic up 15%) far outweigh the reduction in potential car-driving customers. Most of the motorists were, as Italian transport planners call them, parasites anyway and only 29.1% of Copenhageners own cars so the benefits of more busses, cyclists and pedestrians were clear from the start. 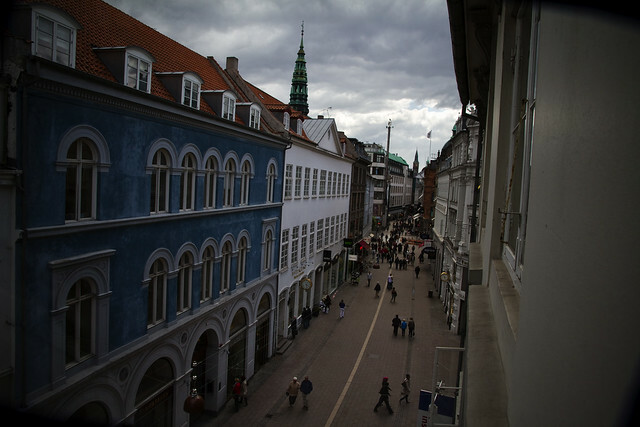 Nørrebrogade has become revitalized and again attracts new investments from retailers, restaurants and cafés. The hustle and bustle of the cars has been replaced with massive numbers of people on bikes and on foot. You can't shop at 50 km/h, but you certainly can on foot or on a bicycle. It's really reassuring - just the experience of crossing the road has become a sheer delight. It boggles the mind that resistance against traffic calming still exists. Last year we wrote an article about some shopkeepers who are complaining about traffic calming on H.C. Ørstedsvej. Saving the Street With Bicycles. As you can read, there is little rationality involved, only wrong perceptions. The third street to be tackled, if SF have their way, will be Amagerbrogade. The goal is a 50% decrease in the number of cars on this main artery - like Nørrebrogade. “The City is made for people, not metal boxes”, said Mayor Ayfer Baykal, and rightly so. One gets the feeling she is already looking at city elections in 2013. Last Monday she broadened out the perspective to include at least a handful more of the main streets in a number of the neighbourhoods. Strategically it was good timing, what with the 50th anniversary of Strøget. Politicians in the wealthy and arch-conservative neighbourhood, Gentofte, were quick to denounce the plans as paralyzing for their city, fearing it will end up as a parking lot for Copenhagen. Another town just outside Copenhagen, the much more progressive Lyngby, is more realistic and praising the step by step approach to reduce car-capacity. Now Lyngby can develop in a similar pace, and has decided to start metering parking, which until now has been free. Lyngby also participates along with a host of other capital region cities in building light rail systems and bicycle superhighways. The national conservative newspaper, Berlingske, not only reported the story of more traffic-calmed shopping streets, but they made it the top-priority and called it "war" with an editorial entitled The Capital Hates Cars. They are furious to a degree I suspect must have been pure rage. Virtually every sentence in the editorial is wrong. It would make Paul Ryan proud. I have never seen such poor journalism. From complaining about absurdly high parking prices (even though 75% of parking in the City is free and less than 1% breaks even on cost or makes a small profit) to complaining about no parking spaces at train stations (research shows almost all stations have available parking), and then forgetting (or choosing to ignore) the fact that most people who take the train prefer to get to the station by bicycle. Then this newspaper continues to blame the City for lack of investments in public transit - which they never blamed the right-wing government for neglecting - and guess who neglected the public transit system for a decade. Finally, knowing it not to be true, they predict the sudden death of retail, again! After playing an instrumental role in killing Copenhagen's congestion ring, Berlingske now have a taste of blood in the back of their throat. My bet is that they are going to continue charging like an SUV. Berlingske claims that the city is implementing a congestion ring through the backdoor, which I think would be fair since it has been the policy of the city for a decade and a half to reduce car traffic, but I am not that optimistic. While that would be great, the initiatives fall short of reducing car traffic by 30% within a time-frame of, say, ten years. Something a congestion ring could do in just 1 - 3 years. But I do complement the strategy. Political parties like SF and Enhedslisten (the far left) are trying to bang the drums more and more about creating 0040 km/h zones, restricting cross-town traffic through densely-populated neighbourhoods and redirecting it to the larger street system. The larger street system gradually, I hope, will be shared more and more equally with bus/light rail lanes, and wider bicycle lanes. And one day 40 km/h is maybe lowered to 30 km/h - like in so many other European cities - or even 20 km/h. It will be interesting to see if the center party (Radikale Venstre), who originally spearheaded Nørrebrogade, and the Social Democrats will support a city for people, or if they will continue the last couple of years insistence on promoting and facilitating more car growth.